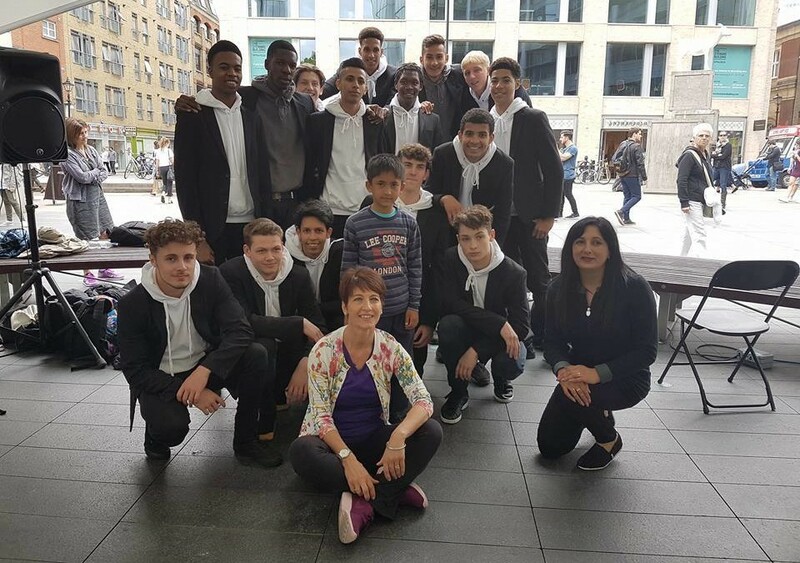 Spitalfields, London – 3rd July 2016, Anna Kennedy OBE, and her charity Anna Kennedy online with her Charity Champions Mala Thapar and Jo Wiggins Anand worked diligently to showcase a vibrant series of amazing Flashmobs. With Big Dance week kicking off in London over the weekend, it was an opportunity to showcase the Anna Kennedy Online Charity and to raise Autism Awareness with a difference! The public were informed of a stall to raise Autism Awareness and what followed was a line of up talented individuals dedicated to surprise passers-by that were enthralled by the public. Soul Symphony choir from Croydon started the atmosphere with a gospel sing off, followed by a high calibre group of trusted individuals suddenly, spontaneously completed a well-rehearsed performance choreographed and taught by Hannah Maxwell (Nuffield Health Studio Manager and also from Bird Gang Dance Group) who has been an avid supporter of the Charity for years. The final showdown when the public thought it was all over until, 7 chairs were lined up and to everyone’s disbelief, none other than ‘Khronos Agoria’ – Britain’s Got Talent 2016 semi-finalists who blew the atmosphere through the roof with their dynamic dance of contemporary dance that had the nation entranced performed with their flawless performance. Anna Kennedy Online and Nuffield Health members alongside the Bird Gang Dance Group had been secretly rehearsing at the Nuffield Health Club in Croydon for several weeks to perform the dance routine, which also involved individuals with Autism. The Choir Soul Symphony had also been working hard to ensure that they opened the day positively by singing “The fight song” followed by “Joyful Joyful” that gripped passers by. Julia Dark Manager of Khronos Agoria immediately agreed to collaborate with the Charity, who are based in The Brit School in Croydon and had been and ended the series with a standing ovation from a huge audience that expected the unexpected that left everyone speechless. The purpose of this day was to raise awareness and place a positive perspective on Autism. Anna Kennedy OBE, Founder of Anna Kennedy Online says, “The flash mob that was organised was a different kind of flash mob as we always like to be different and are far from monotonous, as our strapline says we forge the path to Autism Awareness and are a small charity that do big things and our strong team work incredibly hard and closely together to make a difference”. Spitalfields Market being in the heart of London was a perfect site and Georgina Godart-Brown from Spitalfields Estate Assistant Management was very supportive of this and offered stalls and ample support to promote the Charity’s intention. Bernie Sawford from The 142s band was the sound engineer who travelled from Cambridge especially to support Anna Kennedy Online.